UPDATED with link to a 2008 album review. 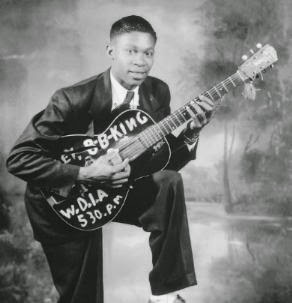 Bluesman B.B. 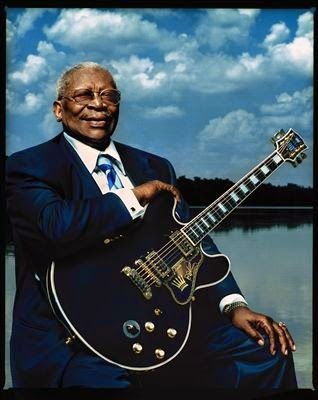 King, one of the most influential blues guitarists in the past century, died Thursday at his home in La Vegas, Nevada. He was 89. His death wasn't unexpected. He'd been in hospice care for a couple of weeks following a reported heart attack. I first saw him in concert in early 1972 at the UNM basketball arena, a place I still call "The Pit." He headlined a bill that also featured a new band called Z.Z. Top, as well as Black Oak, Arkansas. The crowd was an odd mixture of well-dressed middle-class African-Americans and scuzzy hippies. Before King went on on, some guy a few rows in front of me got in an argument with another guy and pulled a pistol. Nearly everyone in out whole section ducked or scattered, I was a newly initiated blues fan. I just figured it was part of the experience. But no shot was fired. No blood was shed. The show went on. And B.B. came out and killed. He sounded as wonderful as Black Oak sounded wretched. About 10 years later I saw B.B. at the Paolo Soleri here in Santa Fe. He was just as good if not better than he was the first time I saw him. After the show I got to interview him back stage. I was just a freelancer for the local weekly, The Santa Fe Reporter, but he treated me like i was the most important music journalist in the country. Seriously, he was one of the sweetest musicians I've ever interviewed. We talked for what seemed like an hour, him telling stories of his life, which he'd told hundreds of other reporters. So here's to Riley "B.B." King. Bluesman, gentleman, inspiration. Here are some songs to remember him by. Back when I was in college, the KUNM Wednesday night blues show used this as their theme song. And here's a Blind Lemon Jefferson song from a fairly recent album, One Kind Favor. The Three Kings, Albert, Freddie and BB, R.I.P.